First, you need to make sure there are no clauses in your house deeds, rental agreement or in local bye-laws against keeping animals (even pet chickens are usually regarded as livestock). Also consider your lifestyle, and whether you’ll have time to look after chickens properly. There is also more information on the laws, rules and regulations for UK residents on this page here if you need it. Chickens destroy a patch of ground very quickly – a traditional chicken run soon becomes a muddy, disease-ridden eyesore. Dividing the run into two, allowing each half to be rested alternately. 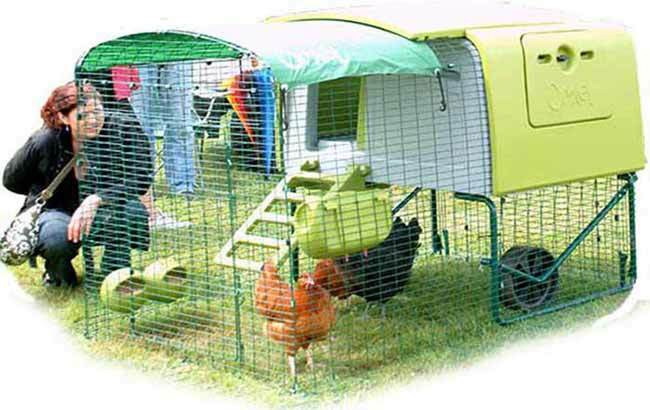 Using a moveable chicken-house and run. Covering the surface of a small run with a thick layer of scratching material (i.e. hardwood chips) that can be cleaned and replaced regularly. Letting the chickens free-range – although they will do some damage to the garden, and may need protection from dogs and predators. 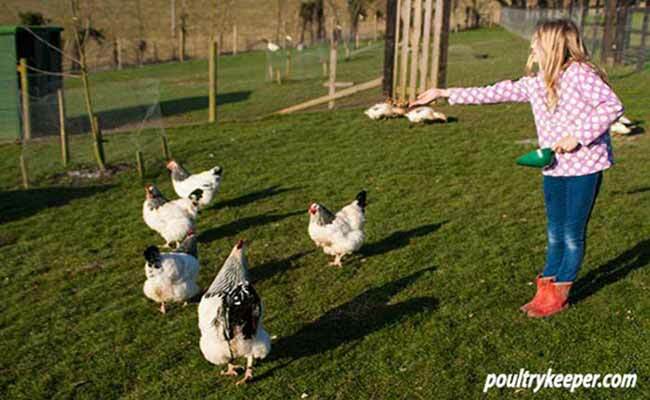 Electric poultry netting is effective in securing chickens. Overcrowding causes stress-related problems and sickness. If space is tight, keep just two or three hens and give them us much room as you can. There is a wide selection of styles and prices – research thoroughly to avoid costly mistakes. 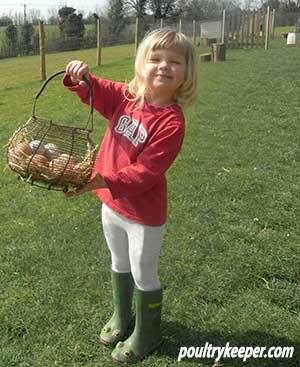 A chicken’s basic needs are for a secure, weatherproof house, with perches for roosting and nest-boxes for eggs. A human’s basic needs are for a coop with easy access, especially when it comes to cleaning it out. The house and run must be robust enough to keep out the large and powerful, as well as the small and lithe. Chicken wire is only proof against chickens! Good insulation and ventilation are essential. There should be 25-30cm of perch for each average-sized chicken. At least one square metre of run space per chicken is required – double that is preferable. A raised house allows chickens to use the area underneath. Moveable housing should be easy to manoeuvre. Wheels are normally required for this. Be careful of second-hand housing, which may contain dormant parasites such as red mite. 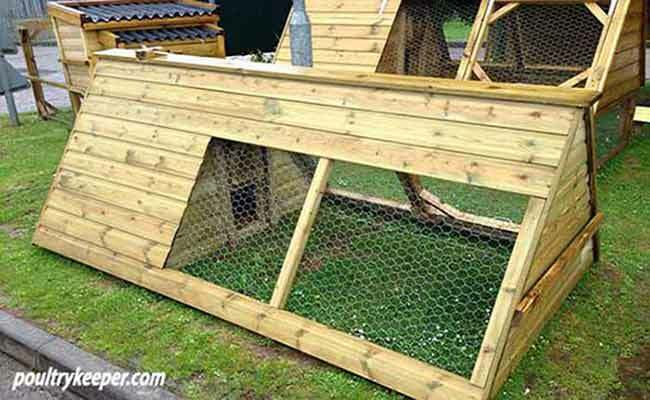 Cheap chicken houses aren’t usually an ideal solution, but if you are on a tight budget then there is more information in this article on some of the cheap chicken coops that are available. Chickens come in a vast assortment of shapes, sizes and characters. All of them lay eggs, but productivity varies enormously. Again it’s worth doing some research to find the right chicken for you. 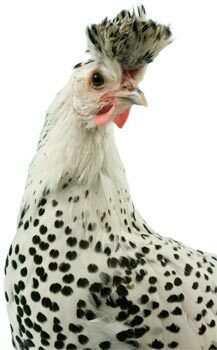 Will you keep traditional, pure-breed hens (some are very beautiful or unusual) or modern hybrids, developed for maximum output? Decide whether your main aim is eggs, meat, children’s pets, an attractive addition to the garden – or all of these. Some chickens are all-rounders, and some are specialists. Photo Right: An Appenzeller Spitzhauben Chicken, a rare breed that has been making a come back in recent years. Buy a well-designed feeder to keep feed dry and prevent waste. A purpose-made drinker helps in providing constant, clean water. Obtain a dry, vermin proof-container for storing feed. 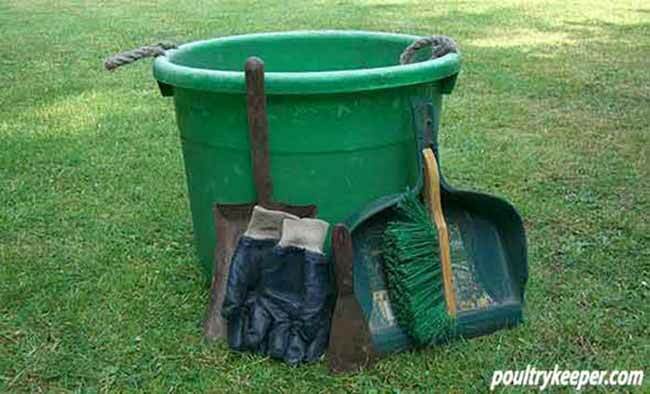 Acquire a shovel, bucket and stiff brush for cleaning-out duties – a scraper is useful too. Poultry Shield is a detergent cleaner that can be used inside the chicken house and also removes red mite, a very common parasite. Provide a dust-bath. A plastic box filled with fine soil or play sand will do the job. A range of equipment used for cleaning out the chicken house. Poultry supply stores offer a tempting range of items, and quality varies. The cheapest can sometimes prove false economy so shop around carefully. It is now illegal in the UK to feed chickens with anything that has been prepared in a kitchen. 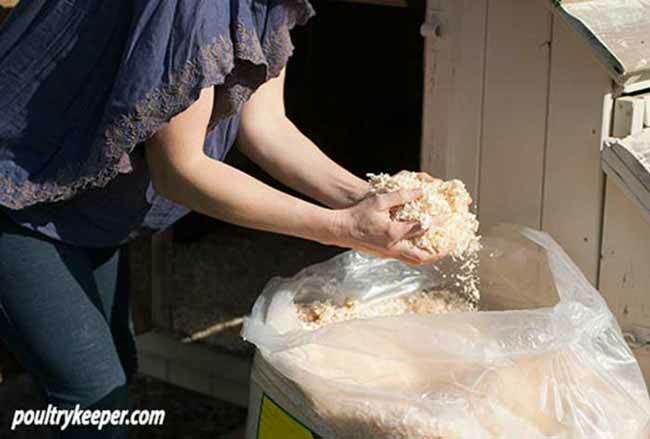 Manufactured chicken feed usually comes as pellets or mash, and will provide your chickens with a balanced diet. Corn is an extra treat – feed sparingly in the afternoons so the chickens eat their main rations first. If you are unsure about feeding then there is more information available in this article: Feeding Chickens. Chickens swallow little stones to break down their food. 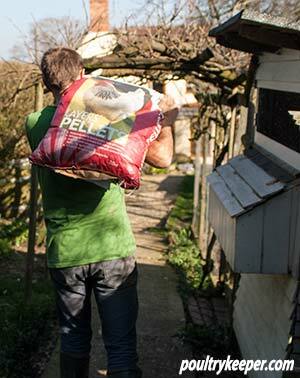 Supply a dish of flint grit (also called insoluble grit) so your chickens can help themselves to what they need. Chickens with no access to grass will appreciate some green vegetables – hang these up to avoid them being trampled and to provide a distraction. If you hang them slightly above their reach, they will jump for them getting some valuable exercise too! Corn should be fed sparingly and regarded as a treat in the afternoon. 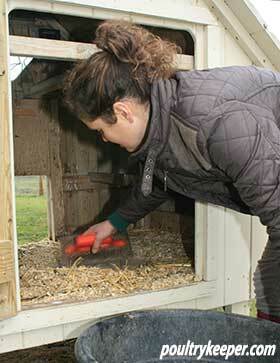 Spread a layer of dust-free, absorbent bedding over the floor of the henhouse to help with cleaning and add insulation. Soft bedding material is also needed for the nest-boxes. Dust-extracted shavings are a popular choice, but there are several other options (see the different types of bedding material available here). Avoid hay or wood bark as they can harbour harmful moulds and spores. Straw tends to be dusty – dust-extracted chopped straw is sold for poultry. Buying from auctions or markets can be risky! 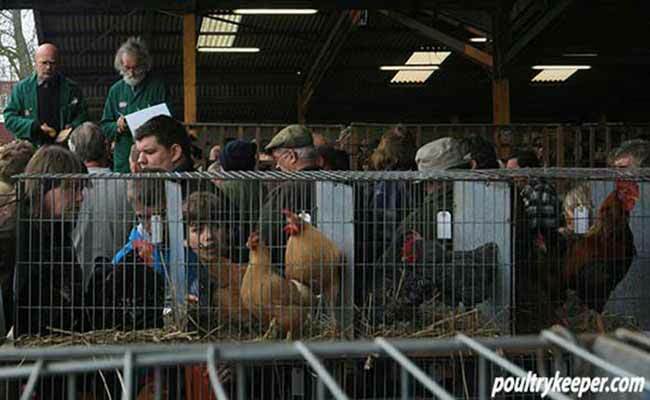 If you go down this route, go to a well organised auction where there is a vet checking the birds for good health. There is more information on buying from auctions here. Look around carefully when visiting your intended supplier. The birds should be kept in clean, spacious conditions. Do they look healthy – alert and bright-eyed? Be wary if any chickens are hunched and miserable, as this is a sign of sickness. The supplier should be happy to give advice, and to take back any birds that prove unhealthy after a few days. Be prepared to wait for a popular breed or hybrid to become available – short-cuts can lead to sickly chickens! 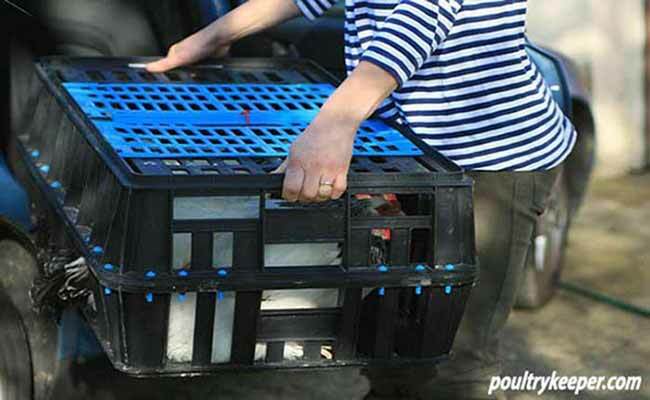 Keep the chickens’ transfer to their new home as calm as possible. Make sure they travel comfortably and don’t get overheated. Have everything ready, and shut them into their house for a few hours so they can settle down quietly (don’t forget to provide food and water). Let your chickens out each morning, give them food and water, and check they are all in good health. Keep an eye on the drinker in very hot or freezing weather. A laying hen needs about 500ml a day. In the evening, collect eggs, clear away food and shut the chickens into their house – they don’t eat or drink when roosting. Chickens go to roost at dusk. This could be mid-afternoon in winter or late at night in high summer. If you are unable to be at home to shut them into their house, it’s worth installing an automatic door closer to keep them safe from predators. Clean out the coop at least once a week. Remove bedding and scrape out droppings. Put down fresh bedding. In fine weather give the house an occasional scrub with poultry disinfectant. When cleaning the house, check for any evidence of red mite (little heaps of grey dust around the ends of the perches and small grey or red mites hidden beneath them). This parasite can debilitate or kill chickens, so act quickly at the first sign of them. See How to Spot Red Mite for more guidance. Green algae is poisonous to chickens, so keep the drinker clean – and give the feeder a regular wash too. A small fixed run will also need frequent cleaning and maintenance. Shift moveable runs as often as necessary. Keep ensuring everything remains weather and predator-proof. Are there any signs of tunnelling or gnawing around the house or run? Deal with repairs quickly, before they become a problem. It’s important to establish a worming regime. (Flubenvet has no egg withdrawal period if given according to the instructions) and to frequently check that every bird is healthy and free from parasites. Chickens are good at hiding illness, so it’s up to the owner to keep an eye on them. Get to know your chickens so you will quickly notice if anything is wrong. If your new chickens aren’t laying, don’t despair! Hens are usually sold at ‘point-of-lay,’ which means they are roughly the right age to produce eggs – but it depends on the time of year and when they were hatched. Pure-breeds are unlikely to start laying in winter, so if you buy young hens in autumn it may be early spring before you see an egg. Your hens will give you eggs for about a year, then stop while they go through their first annual moult. Egg-laying starts again when they have re-feathered, although pure-breeds usually moult in autumn and some may not lay again until the following spring. A hen’s first eggs are small, and there may be oddities until her system settles down. Once she is into her laying stride, eggs become larger and more regular until she moults. When she starts laying again, the eggs are usually a little larger than before. This overview of chicken-keeping is designed to help you get started on this fascinating hobby. There is a wealth of information available, both on-line and in print. The more you learn – the more you will want to know!